How is your summer reading going? On May 31, 1988, Reagan stood on Russian soil and addressed a packed audience at Moscow State University, delivering a remarkable speech that capped his first visit to the Soviet capital. This fourth in a series of summits between Reagan and Soviet General Secretary Mikhail Gorbachev in their tireless efforts to reduce the nuclear threat. 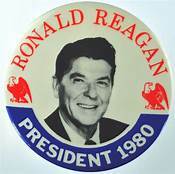 Reagan viewed it as “a grand historical moment”: an opportunity to light a path for the Soviet people—toward freedom, human rights, and a future he told them they could embrace if they chose. It was the first time an American president had given an address about human rights on Russian soil. The importance of Reagan’s Moscow speech was largely overlooked at the time, but the new world he spoke of was fast approaching; the following year, in November 1989, the Berlin Wall fell and the Soviet Union began to disintegrate, leaving the United States the sole superpower on the world stage. Today, the end of the Cold War is perhaps the defining historical moment of the past half-century and must be understood if we are to make sense of America’s current place in the world, amid the re-emergence of US-Russian tensions during Vladimir Putin’s tenure. Baier illuminates the character of one of our nation’s most venerated leaders—and reveals the unique qualities that allowed him to succeed in forming an alliance for peace with the Soviet Union when his predecessors had fallen short. I have my Godson, Thomas, and his sister, Peggy, to thank for my autographed copy of Three Days. Thomas knew how much I enjoyed Baier’s Eisenhauer’s book built around the three days before Jack Kennedy was inaugurated. It is a fabulous read. These are interesting reads about our American story, about two important men and how they helped shape that story. Author, Bret Baier deserves the acclaim he is receiving for both these books. ENJOY! 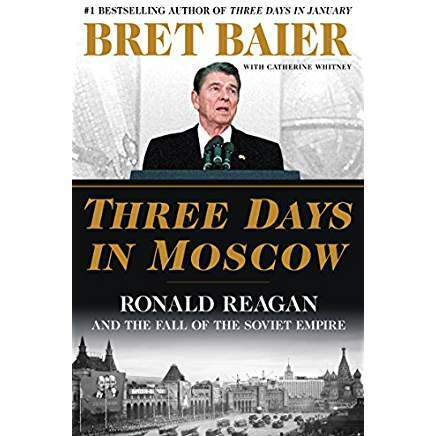 This entry was posted in Book Reviews and tagged Bookreviews, Three Days in Moscow-Bret Baier. Bookmark the permalink. I remember that time well since I was living in France and had visited the USSR shortly before Reagan’s visit and speech. Moving to the USA showed me how complex the relationship between these equally strong nations had always been. The cold war seen from France was not the same as the one seen from the U.S. The consequences are lasting, for sure. I’ve not read this book as I favor fiction, but some can be a great way to remind us of some events that didn’t appear significant when they happened.